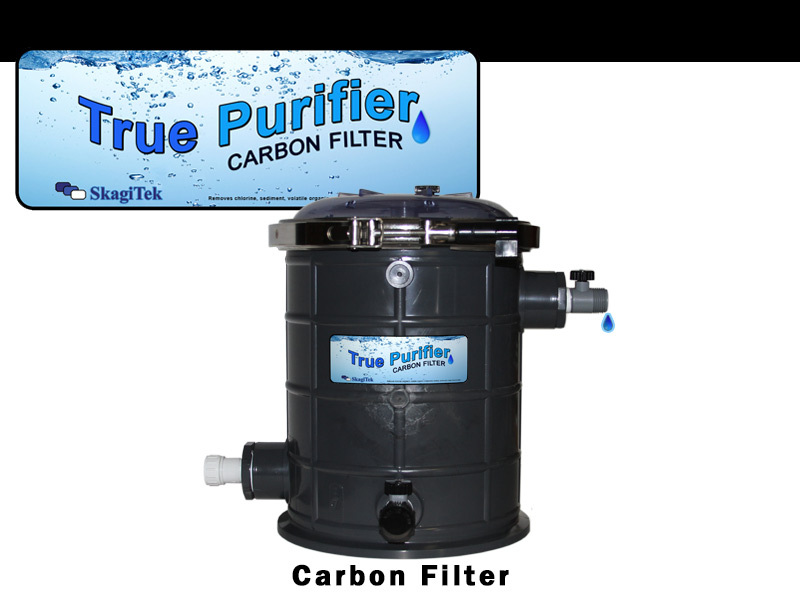 True Purifier Carbon Filter - SkagiTek Inc. 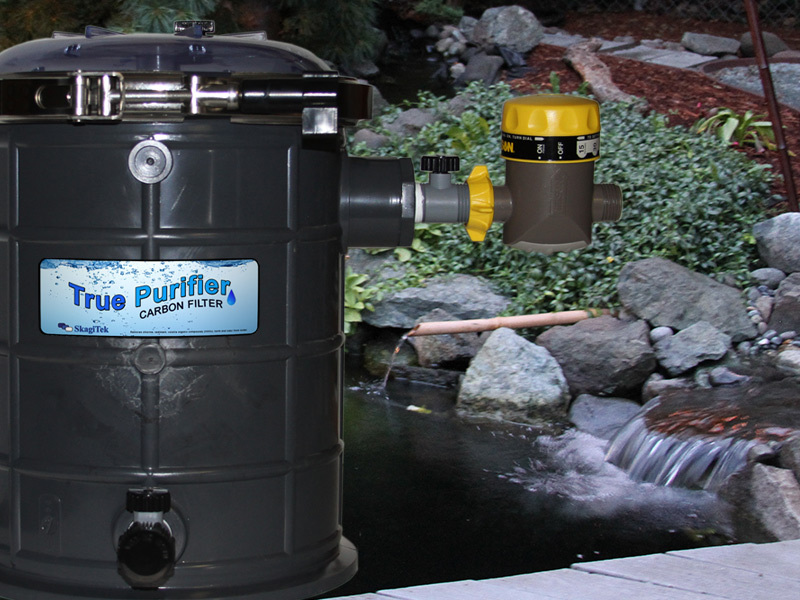 This filter can be used for filling Koi ponds, hydroponics, aquaponics, fish aquariums or in the home for filtering tap water.The True Purifier solves water problems by being able to remove so much more than just chlorine, it also removes contaminants and VOCs. 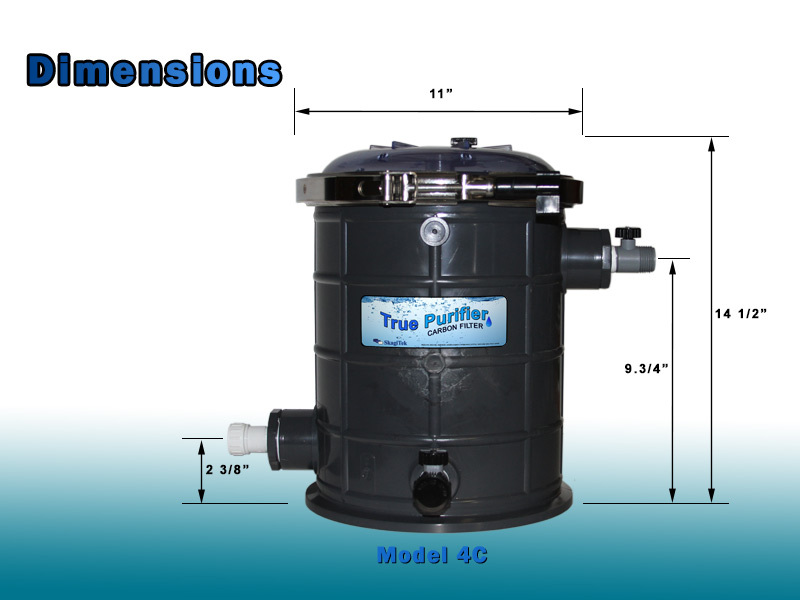 Whether you are looking for solving a variety of water problems or just want to find comfort in knowing that the water is now safe for your fish or for drinking, this filter delivers. 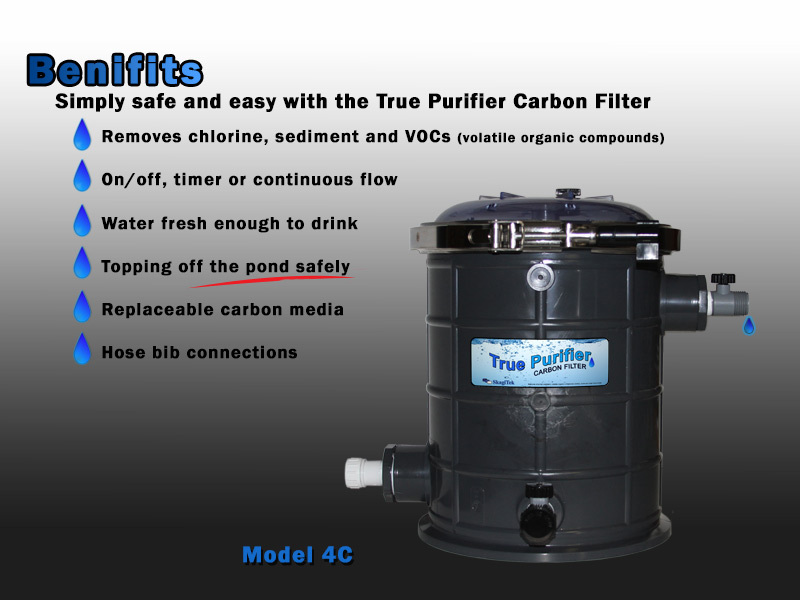 The amount of carbon in this filter can easily last up to 5 years for removing chlorine. It also removes Fluorides, gases and bad smells from city water as well. Designed in a heavy duty canister that permits ease of use, replaceable carbon and washable pad filters. Beyond filtering out chlorine and chemicals from city water, the True Purifier can also be used to prevent disasters in your pond. If foriegn chemicals somehow find a way into your pond, for example from the wind blowing weed killer or poison from your nieghbor's yard to your pond, then the charcoal in the True Purifier could mean the difference between life and death for your Koi fish. If dangerous chemicals get in your pond, you can open the top of the True Purifier and take the bag of charcoal out and place it in a high traffic area in your pond, such as a stream, waterfall, or your skimmer. Leave the bag of charcoal in the high flow area of your pond for at least 24 hours to remove as much of the dangerous chemical as possible. Included is a manual timer that permits automatic shutting off of the flow. This prevents over flowing for those that do not have an over flow drain system. It has an On / Off setting and 8 other settings that allow it to run for 15 minutes up to 2 hours. Say goodbye to figuring out how to plumb a filter. This filter easily connects using hose bib connections. Simply connect your supply hose to the entry bib connection and its ready to start suppling fresh clean and safe water out the upper hose bib connection. The upper bib connection has a ball valve that permits complete control of the flow. Our pellet carbon has the capacity to keep on absorbing. It not only retains Superior abortion capabilities, it also converts the toxic Chlorine catalytically so you get fresh Chlorine free water for years. 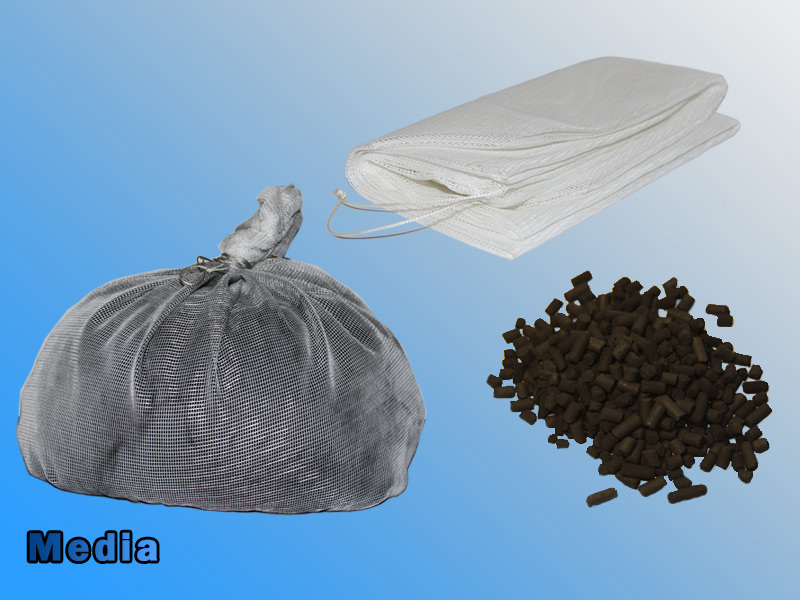 Pellet carbon also assures high flow capabilities and no clogging. The amount of carbon assures a very generous amount of surface area to continue handling both physical and chemical process to filter out unwanted contaminants. The physical process involves running water through a media that retains the contaminants while allowing the water to pass. The chemical process uses a reaction called adsorption, in which the atomic charge of the carbon and other media causes the contaminants to abandon their bond with the water and chemically attach to the media. 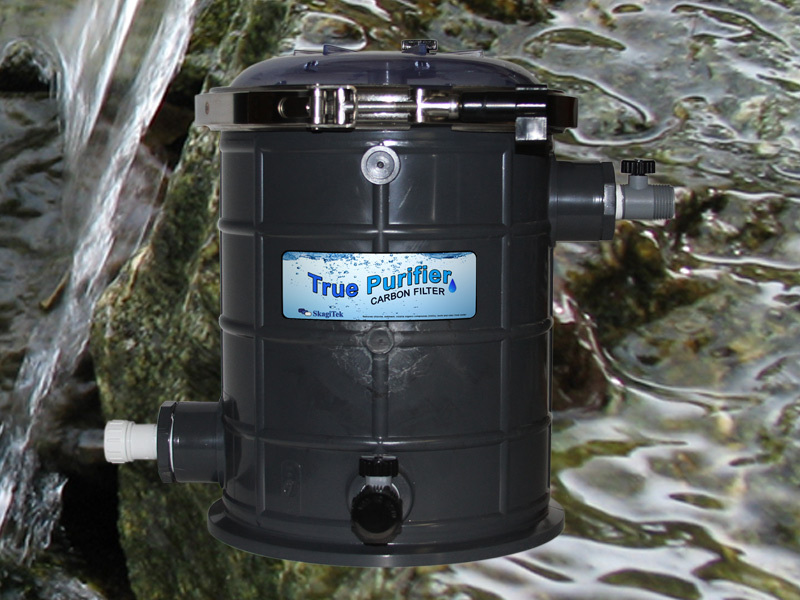 The True Purifier was designed to provide a continuous supply of water and treat it for for years with no maintenance required. The water enters the base and is permitted to be used from two points. One point is lower and unfiltered while the upper point is 100% filtered. Both connections are hose bib male threaded ball valves that permit the connection of a garden hose to each. Use the lower point as a handy location for any number of reasons you may find the need to have a hose connection for. 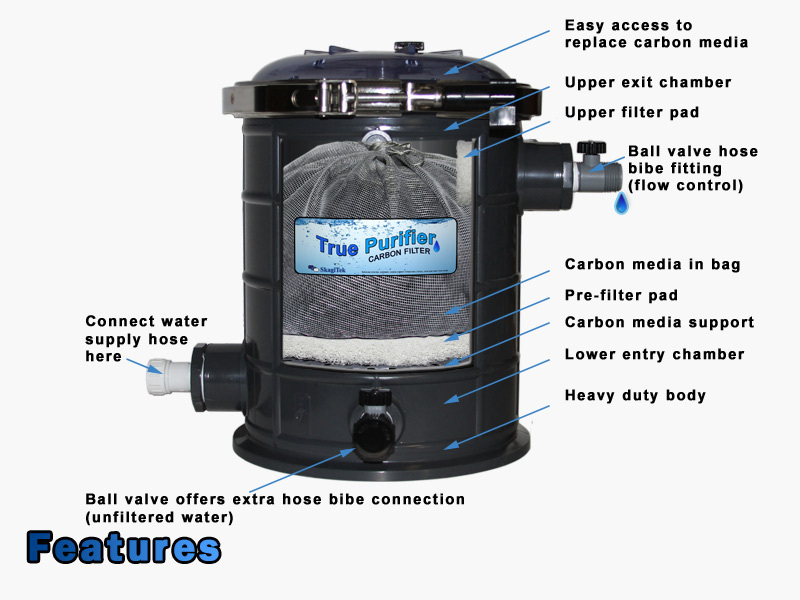 The water that reaches the upper hose bib point passes through a per-filter, the carbon and then a fines filter resulting in treated fresh filtered water. The filter pads inside are washable and easy to replace. The Carbon is self contained in a bag for easy lift out replacement. It can easily last for 5 years of continuous water passing through it when just used as a carbon filter to remove Chlorine. To replace, open the top, lift out the bag, empty and refill with new carbon. I prefer this carbon filter over my other canister cartridge carbon filters. There is much more carbon in the True Purifier. I also really like the ability to connect a garden hose to it for watering plants close to my equipment. Having this in my pump equipment house makes it easy to top off my pond safely after back washing the filters. Iv been needing this for a long time. I wish I would have had this last year when I was adding water to the pond. I forgot the hose was running and found all my fish were dead the next morning.